Some 5,000 women, men and children attended BlogHer ’12 in New York City this year. 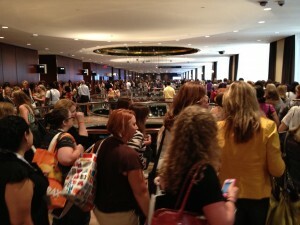 This is the line for lunch…and Martha Stewart’s keynote on Friday. I’m still processing everything I discovered at this year’s BlogHer conference, held Aug. 2 – 4 in Manhattan. I learned tons, met hundreds of amazing, talented, hard-working bloggers, gathered helpful tips and a bit of swag (I left a healthy selection of the better stuff for the chambermaid – now, there’s a hard-working woman! ), and felt inspired by the sheer exuberance of the crowds and the willingness of everyone to share what they know. 6. Blogging isn’t dead – a whole medium doesn’t die, notes Elan Morgan. Media evolve. But, if we don’t gather and talk about blogging, in the way businesses discuss strategy and the future, we lose community. 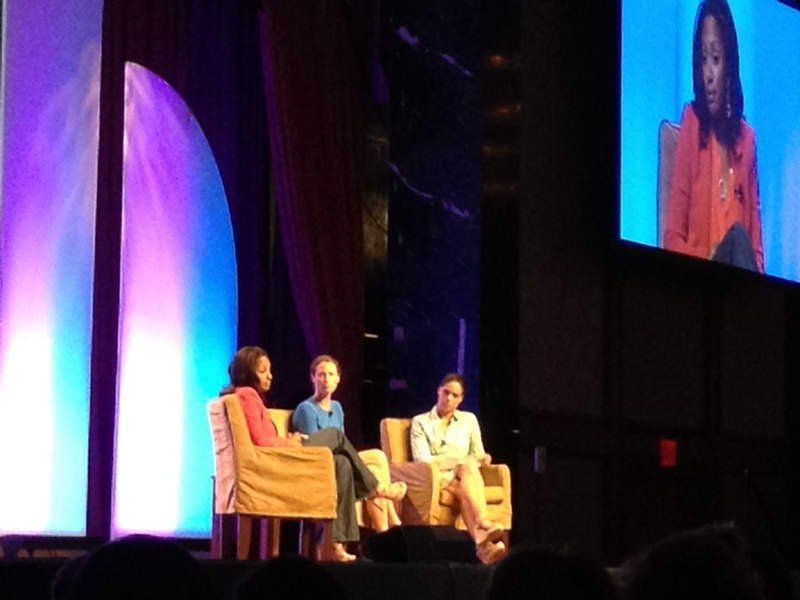 Soledad O’Brien (at left) moderated the keynote talk, “Women Influencers as Change Agents,” with Malaak Compton-Rock (right) and Christy Turlington-Burns (middle). 5. Children can become junior board members at age 12, according to CNN’s Soledad O’Brien – while this may not be appropriate for every board or organization, imagine the eye-opening conversations about the consequences of decisions if board members had to think beyond the next quarter and out to the next generation. 4. Even in a world of Likes, Pins and Plusses, the best way to engage is still face-to-face – because then it’s not about “What can you do for me?,” but “How are you?” Real engagement happens when you’re ready to listen, says Doug French, founder of the Dad 2.0 Summit. 2. If you want to work with brands, you must stay true to yourself – your credibility is based on your honesty and transparency on your blog. Smart brands want to tap into strong voices; they don’t want to change you or put conditions on what you write. Make sure you work with brands that want you to remain consistent with your values and voice. 1. Don’t be afraid to ask – virtually every panelist made this point. The social media world is incredibly open and forthright. What’s the worst that could happen? Someone says No? The next person will say Yes. If you don’t ask, you won’t know. If you don’t know, you can’t learn. If you don’t learn, you stagnate. Join in, ask, discover, and return the favor when you can! This entry was posted in Blogging and tagged blogging, BlogHer '12, engagement, social media by Vickie Bates. Bookmark the permalink. Thanks for summarizing these inspirational words of wisdom, Vickie. I think it’s important for us bloggers to gain these insights; it sounds as though this conference was a worthwhile experience all around. I really like the “What you give away for free is rarely valued” comment. It’s very tempting for me to want to “give away” my work. I suppose the BlogHer conference would go a long way toward boosting my confidence as a blogger/writer/photographer. I’m glad you found these highlights as inspiring as I did. One great thing about conferences is that they get us out of our comfort zones. You’re in a different city, your regular schedule is upended, all new faces…you’re stretching your mind and ready to hear all the inspiring ideas that the speakers have to say! Whether someone chooses BlogWorld, BlogHer or a blogging bootcamp – I think these events are high value for bloggers.